In Gout And Acupuncture I show how acupuncture is used to treat gout. Specifically, I look at acupuncture to treat gout pain. Also, to treat excess uric acid. I wrote Gout And Acupuncture for GoutPal Seekers. 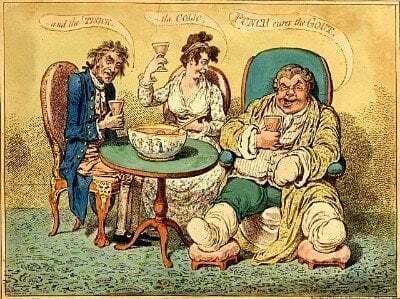 So, to find which type of gout sufferer you are, read Questions for Gout Sufferers first. In particular, Gout And Acupuncture helps GoutPal Seekers at Step 3. That is, it helps you learn more ways to treat gout pain and uric acid. Firstly, I should explain what acupuncture is. Because the common Western view is “sticking needles into various parts of the body”. Indeed, acupuncturists define that as Western Medical Acupuncture (WMA). Electroacupuncture where they stimulate acupuncture needles electronically at different frequencies. Moxibustion where they burn Chinese mugwort herb in various ways. Cupping where they apply suction to acupuncture points. To begin with, I reviewed 3 studies of gout and acupuncture. Then, I noted that most research is in the Chinese language. At the present time, this continues. So, that limits our research. However, English language reports on gout and acupuncture are increasing. As I show in later sections below. a summary of the clinical application of acu-moxibustion therapy in the treatment of gouty arthritis in recent 10 years. Acupuncture needles often used are filiform needle, red-hot needle, moxibustion-warmed needle and three-edged needle. Clinical studies showed that acupuncture therapy has a definite efficacy for gout relief and has its clinical characteristics, such as faster efficacy, lower relapse rate, etc. in comparison with medication. Lin, C. X., et al (2009). On the basis of diet intervention, electro-acupuncture plus blood-letting puncture and cupping is a better therapy for acute gouty arthritis. Zhao, Q. W., et al (2009). The surrounded needling therapy group was treated with shallow needling on local affected area as main and 4-5 distant acupoints as adjuvant, once each day. […] Surrounded needling therapy is superior to the western medicine in the therapeutic effect on acute gouty arthritis. And it is a safe and effective method for acute gouty arthritis. Xie, X. Q., et al (2009). Later, I reviewed an acupuncture summary. Then I presented data for uric acid reduction. Also, for gout pain control. In Treat Uric Acid With Acupuncture I review 8 studies. In detail, I describe acupuncture points for uric acid control. Also, I list uric acid reductions from these studies. In Treat Gout Pain With Acupuncture I review 4 studies. Although studies show acupuncture relieves gout pain, I recommend caution. Because responses to gout pain are very personal. Therefore, you must ensure you get a personal treatment package. But that applies to every gout treatment plan, not just acupuncture. In addition, you can read an updated review of gout and acupuncture studies. Generally, these studies are low quality. Certainly, they are no substitute for arranging your own acupuncture treatment plan. In general, the studies show acupuncture is a great tool for gout sufferers. But, you must ensure the competency of the person using the tool. Especially note that this is true of all tools that can help your gout, including drugs, herbs, and diet. In summary, you can see acupuncture can help both uric acid and gout pain control. So, to get effective treatment, you must find an effective acupuncturist. Currently, I’m not aware of acupuncturists who can treat gout. But, it’s always worth asking in the gout forums. Also, I can help you plan how you treat your gout. Then guide you through the next steps of your gout management plan. 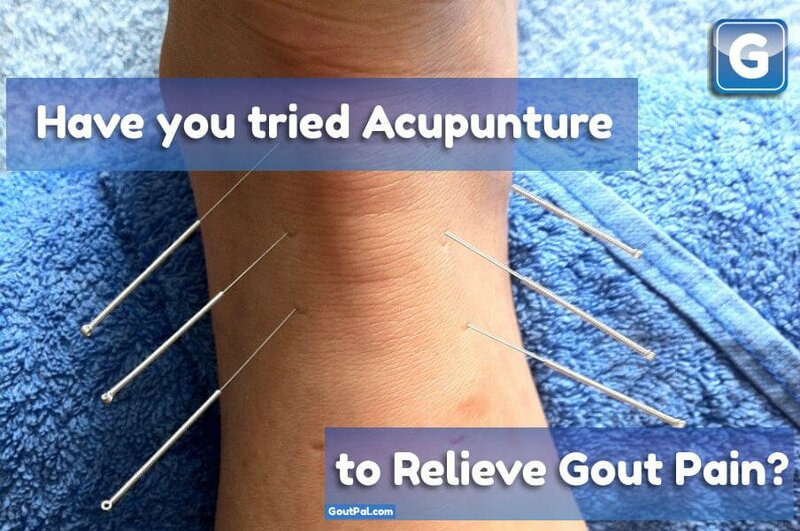 Have you experienced acupuncture to treat gout? Please share your views in the gout forums. White, Adrian, and Editorial Board of Acupuncture in Medicine. “Western medical acupuncture: a definition.” Acupuncture in Medicine 27.1 (2009): 33. Lin, C. X., et al. “Clinical application of acupuncture and moxibustion to the treatment of gouty arthritis and analysis on their therapeutic effects.” Zhen ci yan jiu= Acupuncture research/[Zhongguo yi xue ke xue yuan Yi xue qing bao yan jiu suo bian ji] 34.1 (2009): 67-69. Zhao, Q. W., et al. “Observation on therapeutic effect of electroacupuncture plus blood-letting puncture and cupping combined with diet intervention for treatment of acute gouty arthritis.” Zhongguo zhen jiu= Chinese acupuncture & moxibustion 29.9 (2009): 711-713. Xie, X. Q., et al. “Observation on therapeutic effect of surrounded needling therapy on acute gouty arthritis.” Zhongguo zhen jiu= Chinese acupuncture & moxibustion 29.5 (2009): 375-377. Lu, Wei-wei, et al. “Update on the Clinical Effect of Acupuncture Therapy in Patients with Gouty Arthritis: Systematic Review and Meta-Analysis.” Evidence-Based Complementary and Alternative Medicine 2016 (2016). GoutPal Members see download link at Review of Gout and Acupuncture Studies. Do you have suggestions for improving Gout And Acupuncture? Then, please add your idea to GoutPal’s Suggestion Box. Or, send the Feedback Form, below.